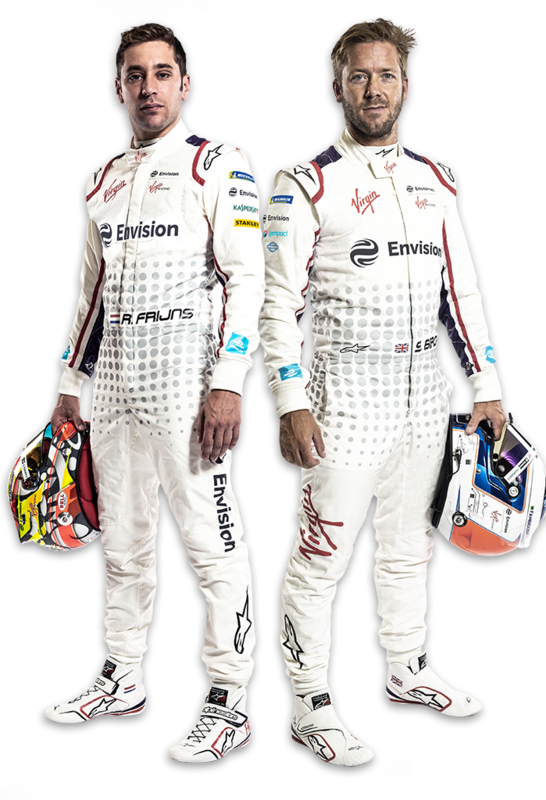 The Envision Virgin Racing Formula E Team is one of the founding and leading outfits in the ABB FIA Formula E Championship – the electric street racing series and the world’s first fully-electric international single-seater category. Dutchman Robin Frijns began his career on an indoor go-kart in Belgium. He quickly progressed through to outdoor karting with the Belgium GKS Lemmens Power team, scoring several podiums in Belgian, French and European Championships. Frijns ended his karting career in 2008, gaining a scholarship to compete in Formula BMW the following year. He completed his first season in Formula BMW as best rookie and third place overall. Following a successful first year, Robin went on to clinch the overall championship title in 2010, with six wins, 13 podium and three pole positions. In 2011, he moved to the Formula Renault 2.0 Eurocup Championship, where Robin yet again proved himself by winning the championship in his rookie season. Success in the European Championship saw Robin graduate into the World Series by Renault 3.5 category for 2012. Competing with Fortec Motorsports Robin once again showed his talent by winning in his debut season. In 2013, with the success of three European single seater titles in a row behind him, Frijns was offered a seat at Sauber Formula 1 where he became the F1 test and reserve driver. During this season, Robin competed in selective GP2 races and after just two races had secured a win. In 2014 Robin became the official test driver for Caterham F1. Frijns continued to race in single-seaters but after a difficult season switched to GT racing for 2015. This decision proved rewarding yet again as he won the Blancpain GT series. In 2016, Robin continued in this championship alongside the Blancpain Sprint and Endurance series with WRT Audi Customer racing. This year he also became an official factory works driver for Audi Motorsport. Alongside his GT career, Robin entered the FIA Formula E Championship in season two as a driver for Andretti Autosport. Frijns finished 10th in his first race and continued to score a podium in Putrajaya that season. He finished in the points in the following two races, scoring all of Andretti’s points for the season and making him the first Formula E rookie to finish his first four races in the top 10. In the 2016/17 season, Robin continued with Andretti, with a new partner, and continued to score points. In January 2018, Frijns gained a seat for Audi Sport driving in the DTM Championship. He will continue to compete in DTM alongside his new drive in Formula E at the Envision Virgin Racing Team. Sam Bird appeared on the karting scene in 2002, racing competitively in events across the UK and Europe and subsequently won a scholarship to race in the inaugural season of Formula BMW in 2004 with Carlin Motorsport. He ended the year with three wins and finished runner-up in the rookie standings. Sam remained in Formula BMW for a second season and finished as championship runner-up. After a number of seasons progressing through Formula Renault and Formula 3 with multiple race victories, Sam held testing duties for Williams F1. He eventually joined forces with Mercedes F1 for the Young Driver Test in Abu Dhabi and was named as their Reserve Driver for the 2011 season. Sam competed in World Series by Renault in 2011 and the following year in GP2, he secured the teams’ title for new team Russian Time. During the 2012 season, Sam continued with the Mercedes AMG Petronas F1 Team helping in team testing and went on to achieve third place in the World Series by Renault with I.S.R Championship. In 2013, Sam was the named the Reserve Driver for the Mercedes AMG Petronas F1 Team. Sam also attained five wins and six podium finishes for team Russian Time in the GP2 series. In the 2014/15 season, Sam accomplished a podium finish in the FIA World Endurance Championship with AF Corse Ferrari, and during the Tudor United Sports Car Championships, broke the Lap Record during the Daytona 24 Hours. During the same season. 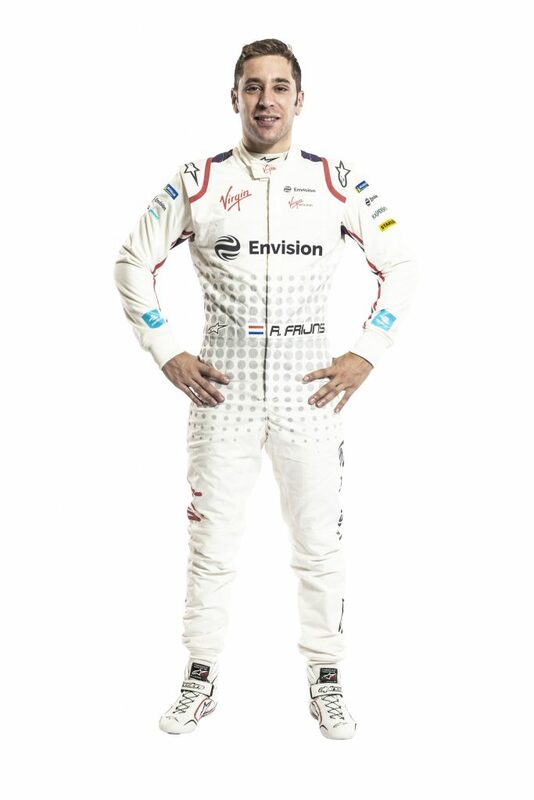 Sam made his debut in the FIA Formula E Championship with Virgin Racing where he achieved two wins, including a home win at the London E-Prix, finishing fifth in the championship overall. In his second Formula E season, Sam continued to impress by gaining more pole positions on the grid than any other driver, one which lead to a spectacular win in Buenos Aires. Season three saw Bird continue to score points throughout the season and finish fourth in the drivers’ standings. Season four again saw the Brit race for the team meaning he has competed in every one of the team’s race starts. A season-long title battle saw Bird finish his best-ever Formula E season, in third place. Sam now boasts a career tally of seven wins and fifteen podiums to make him the third all-time Formula E points scorer. 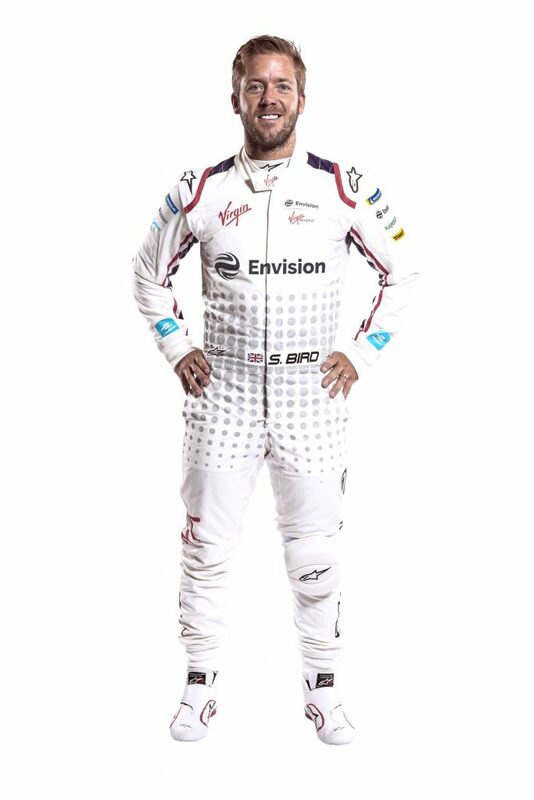 Bird will remain at Envision Virgin Racing for the fifth Formula E season, where he will continue to challenge for race wins in the Gen2 car. Overseeing the team’s operations is Managing Director and Chief Technology Officer Sylvain Filippi, who has been with the team since day one, together with Team & Sporting Manager Leon Price, Technical Director Chris Gorne and Chief Marketing Officer Cameron Maultby. After obtaining a Masters degree in business, Sylvain swiftly moved into the automotive industry to pursue his passion for cars. Having worked for several major car manufacturers, the Frenchman began working with electric cars in 2007 and completely fell in love with them. Moving away from the manufacturing world, he then went on to set up the world’s first circuit race series for zero-emission electric vehicles – the EV Cup. 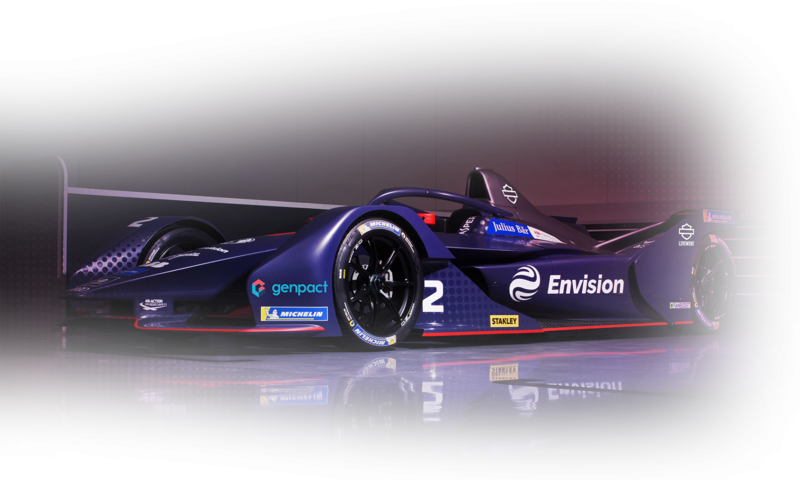 With a strong belief in the uptake of EVs globally, and an electric car owner himself, Sylvain then moved to Formula E – joining the team from the very beginning as a founding member. 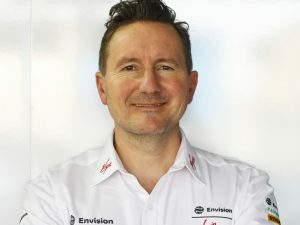 Now in his fifth season with the team, Sylvain holds the role of Managing Director and Chief Technology Officer, where he has overall responsibility of all aspects of the sporting and commercial elements. With over 20 years’ experience, Leon has worked in practically all areas of motorsport. Starting out in the FIA GT Championship before moving on to the American Le Mans Series and the European Le Mans Series, he worked in Renault V6 as a No.1 mechanic, before entering GP2 (now FIA Formula 2) and the GP2 Asia Series as a Team Manager and Chief Mechanic. He then joined GP3 Series as Head of Operations before entering the world of Formula E, joining the team at the end of season one. 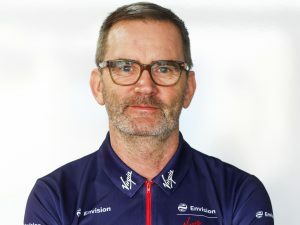 His many years of experience have allowed him to have a strong leadership role within the race team, working with both mechanics and engineers, to ensure the smooth running of the team on and off track. Whilst at home, Leon enjoys spending time with his family, as well as supporting his favourite football team, Chelsea. Working in close collaboration with Leon Price and Sylvain Filippi, Chris works as the team’s Technical Director heading up the engineers’ department. Educated at Coventry University, Chris boasts over 30 years' engineering experience in virtually every level of motorsport outside of Formula 1. After working in the likes of Touring Cars, British F3, Formula Renault 3.5, GP2, Le Mans and sportscars, Chris joined the team in January 2016 having previously worked for another Formula E team. 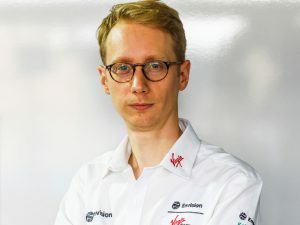 He is an invaluable member of the team travelling to all races, as well as all simulator sessions, ensuring the smooth running of the team’s engineers, race strategy and driver performance. When he’s not working, he enjoys cycling, as well as spending time with his family. As a founding member of the team, Cameron was also instrumental in its formation working alongside the then CEO and CTO to create the outfit. Born and raised in Australia, he graduated from the University of Queensland before moving to the UK, where he later set up his own sports marketing company called Heat. 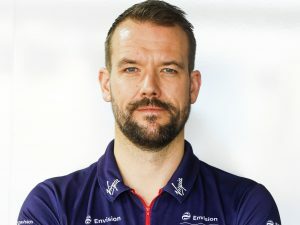 As well as working for high profile companies such as Red Bull Racing, Cameron brings with him a wealth of experience and is currently responsible for the entire commercial operation at Envision Virgin Racing covering sales and marketing, PR, events, design and brand. Now based in Brighton, in his spare time he enjoys playing the guitar and spending time with his family.